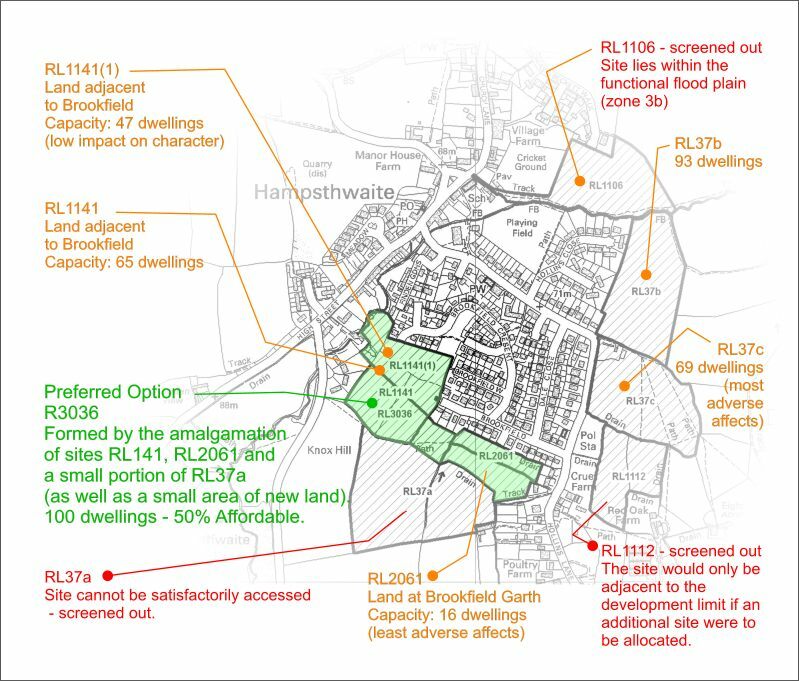 HBC's preferred option for Hampsthwaite is RL3036 - Land South of Brookfield, Hampsthwaite. Access would be through the 'Brookfield' estate on either Brookfield, Brookfield Garth or Brookfield Crescent. The proposal is to provide about 100 dwellings, to be a mix of market housing (50%) and homes for local people and families at affordable prices (50%). This is a large site, and is formed by the amalgamation of the previosuly designated sites RL141, RL2061 and a small portion of RL37a (as well as a small area of new land) - see map below and the previous web site entry. The site is described as being all agricultural land and has some individual trees covered by a Tree Preservation Order within it, and a public right of way crossing it. The site borders the conservation area and a Listed Building set within a small/medium garden to the northwest. There is also a small pond on this side of the site. This site was part of larger site "Hampst2 - Land south of Brookfield" which was put forward previously for housing. The inspector at that time stated that the loss of green field land would be objectionable (but HBC are attempting to point out that he did not say it would harm the form and structure of the village). The reasons that this proposal was rejected on two previous occasions remain valid today - i.e. (adapted from the appeal summary by the Secretary of State) it would harm the form of the village, making the area too urban, being a significant harmful intrusion into the existing countryside. Here you can download the West consultation newspaper (6.5MB) and Harrogate District Sites and Policies DPD: Assessment of Site Options for Glasshouses to Hampsthwaite (8.3 Mb pdf). You are invited to submit your comments using the consultation questionnaire. You can download the questionnaire below, complete it and email to ldf@harrogate.gov.uk or post to the LDF FREEPOST address (shown on the questionnaire). The closing day for comments is Friday 26 November 2010.